Sparkler is a popular firework and even those don’t burst crackers would like to hold sparkler which is less dangerous and harm to environment. From kids to old sparklers bring smile and merry during the occasion of Deepavali, and it’s the only firework that I could light. 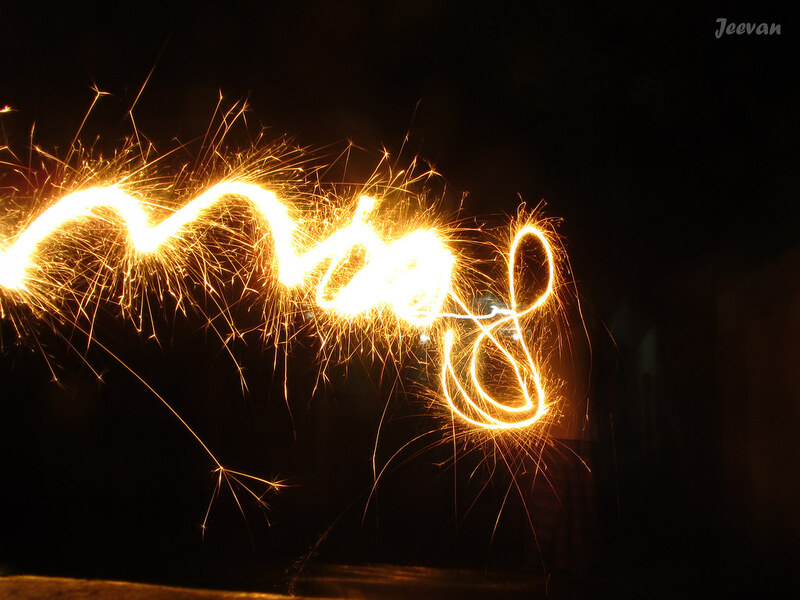 Every year I like creating some images using the firework mode in the camera by letting someone move the burning sparkler in random, as well certain directions to get interesting designs. Usually my father used to help me on the fun task by making different moves on holding the sparkler to let me capture the images. Following are few designs we created together, though he isn’t much interested in what I shoot he was cheerful to execute these for me to exhibit. It gave me different perspectives and I have note it down beneath each image. 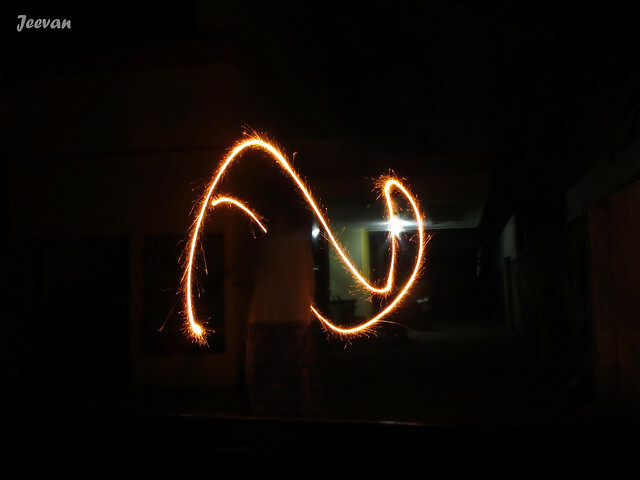 Deepavali, aka Diwali is just two days away (Oct 18) and it feels exciting. Deepavali (Festival of Lights) always been my favourite festival and I always look forward for this day, and fireworks is the main reason for me to feel alike. I have grown up bursting fireworks and I really enjoy watching the dazzling light and colours coming out of the fireworks and the sounds that create a joy mood. 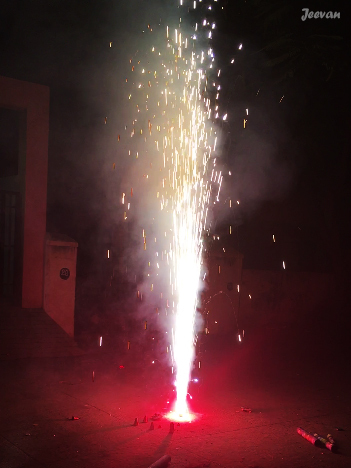 I wasn’t a fan of loud crackers and I have stopped buying those (burst in the ground) long back, but still the sounds come from the neighbourhood during Diwali resonates joy. 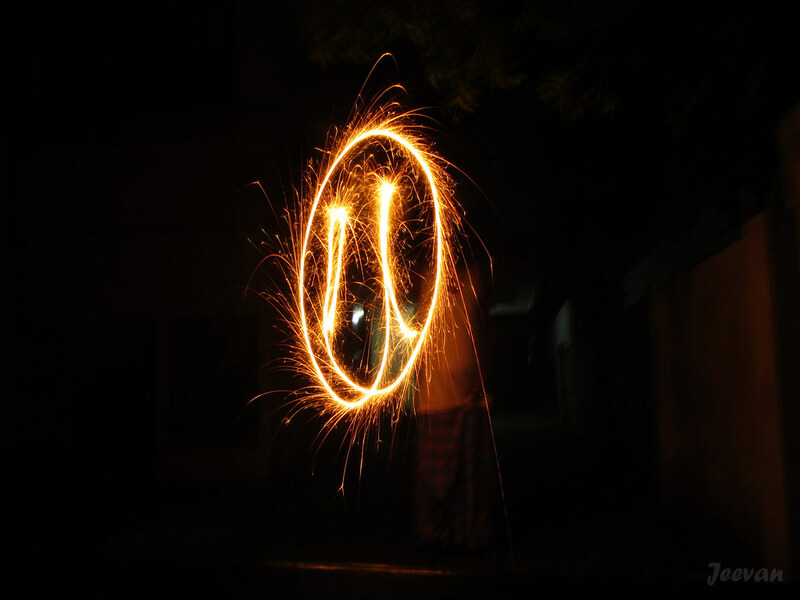 Glad I had a wonderful childhood and memories of Deepavali, a time where I felt cheerful and continue to be so with memories to cherish. Though the only firework I could lit being sparkles, I used to buy certain fireworks to (let someone) light up to enjoy the glowing spectacle. 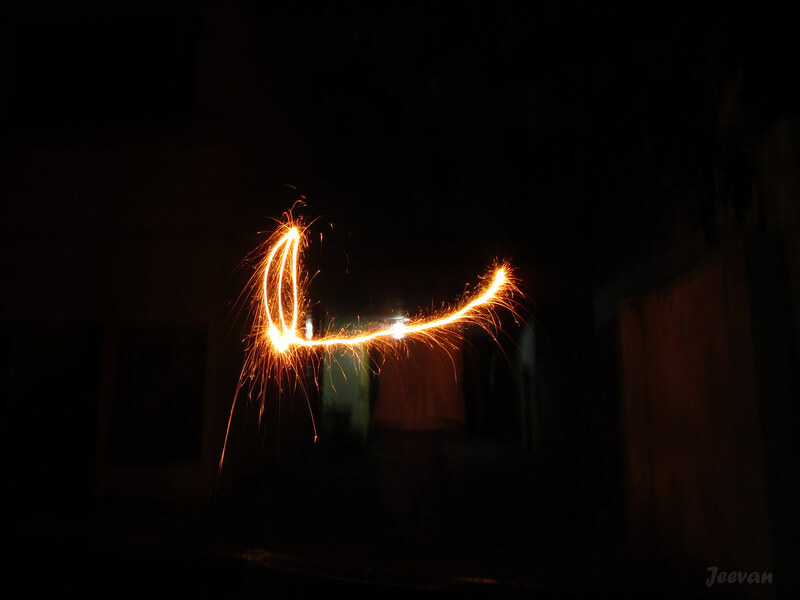 While residing in apartment (from 2006-2013) the celebration touched beyond fireworks, where we shared the festival spirit with neighbours who share sweets and snacks (of different kinds) with each other. Dressed in new attires, it’s wonderful to watch and receive greeting from friendly residents. 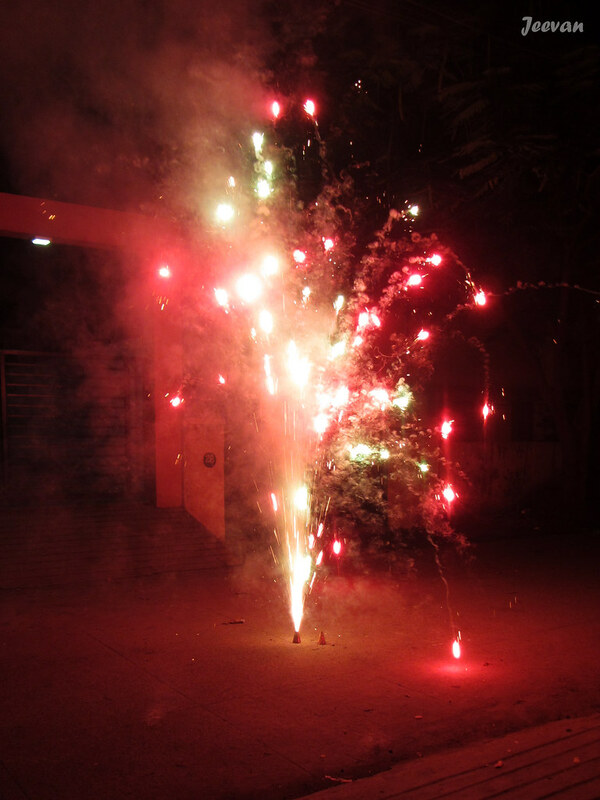 And in evening/night the kids gather in front of the apartment and make a dazzling show of fireworks, and I would be out watching their activities before going to my great aunt’s house in the suburb to light our fireworks and watch others aerial outs. I really miss all the things now, but still the festival light continues to glow and engross. 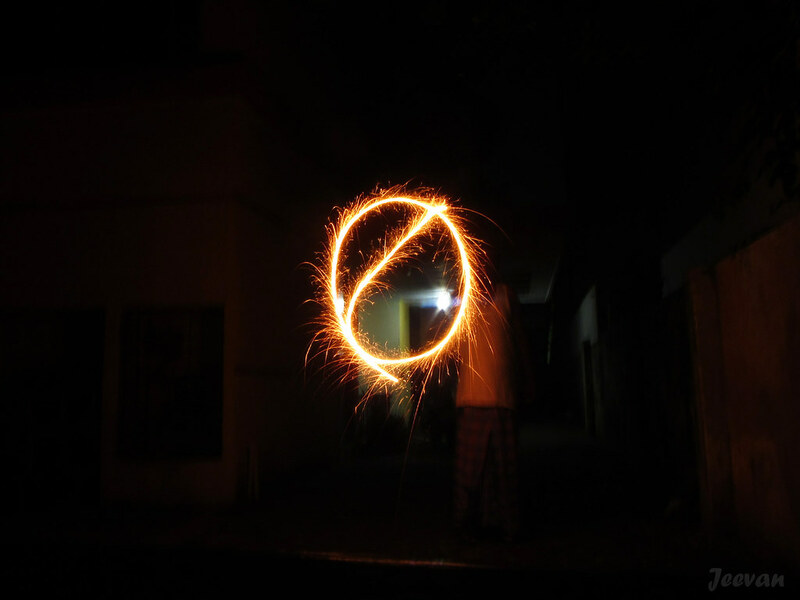 I could understand the opposition rising against bursting firework and the Supreme Court has banned selling fireworks at some places including the nation capital Delhi, where it created huge air pollution during last Diwali. Though it wasn’t the only reason for a city that tops the chart in pollution normally, fireworks added light to the glowing issue. 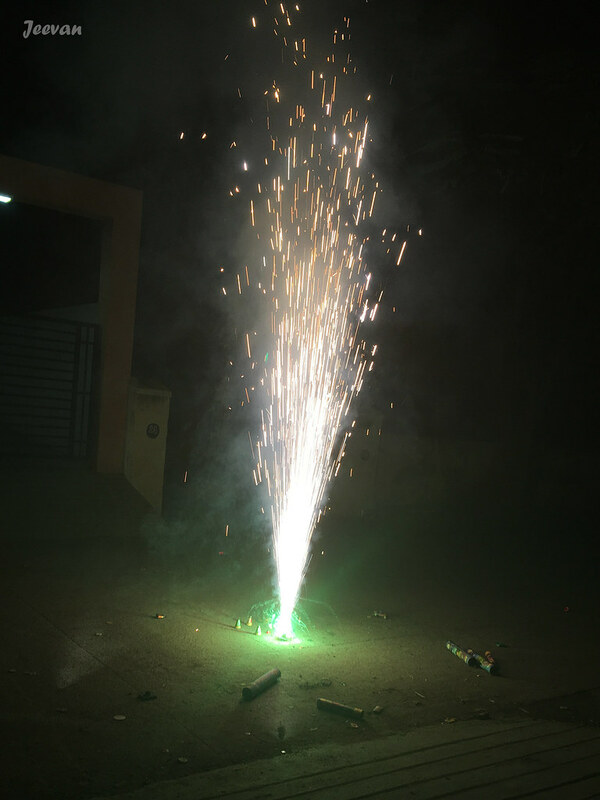 Whatever they say, it’s not easy to erase the thought of Deepavali without fireworks, though we have no trace from when fireworks included in celebration, for kids growing up bursting fireworks is least possible to give up. I don’t think those stopped busting fireworks (or ever done with it) are conscious about nature and environment. Its sheer delight of gadgets, internet and television that keeps away people from fireworks, though it may sound good, but when it applies to all festivals and events doesn’t sound same. Diwali is a day in a year unlike these that continue to occupy us in good as well opposite ways. 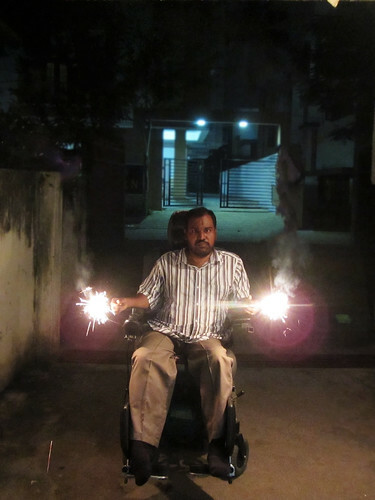 There are scientific reasons that have been boon and bane supporting those who approve, as well oppose to fireworks. I’m not saying bursting firework is good or it should be completely ban. Firework industry in Tamil Nadu is a huge one and it has been a livelihood for more than 0.8 million people, but it isn’t that we all should buy firework and support their lives. Alternate jobs will sure to be better than making fireworks, which threat lives directly and it would take long time and for that huge change to happen but instead of banning reducing its usage would be better option. Could we stop the New Year celebrations that open with grand fireworks across the globe or any sports events that loud cry with dazzling fireworks. I think regulating things and rule stronger guidelines will sure control the level of pollution in many ways. As for now let stop here and celebrate Deepavali and what we need to add is more light and sweetness to the festival that illuminate the country and whoever practice the lighting festival. Pls share anything that adds sweetness with your near and dear ones, and fireworks wasn’t the only thing about Deepavali (or any other festival) that I believe is based on get-together and sharing happiness and bond between family and friends. Cheers! 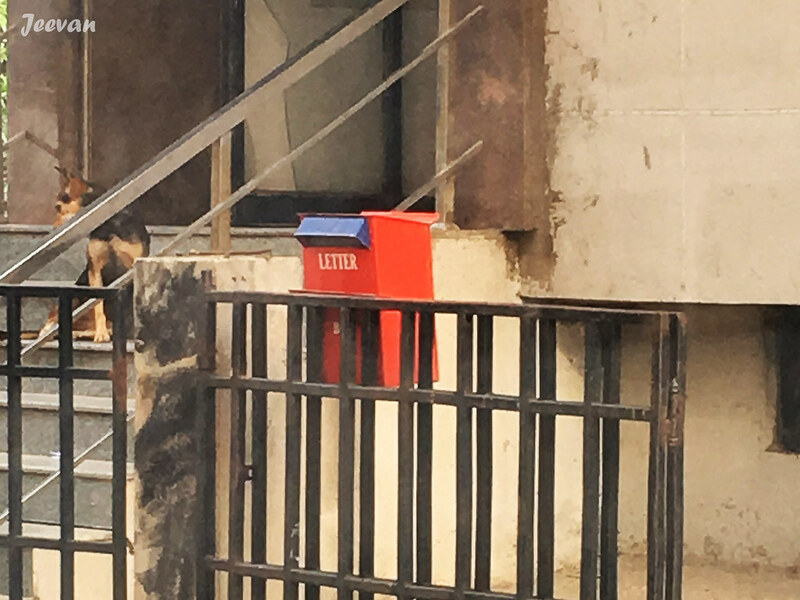 The red letter box is one of my favourite things from childhood. Many a time I wish to have one to hang on our house gate, but it never happened. Our current house had a letter box and it broke down last year, though it isn’t a red letter box. 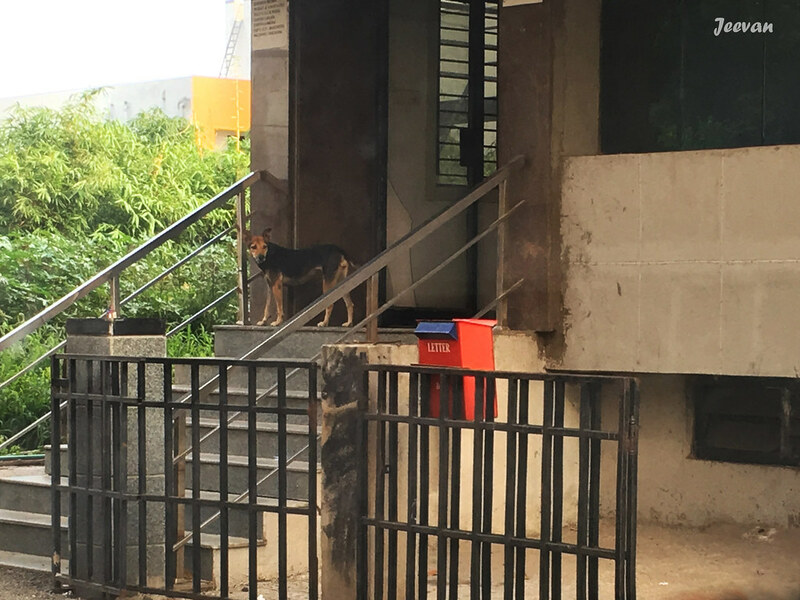 I find the above red letter box from the side gates of the KFC restaurant in Kottivakkam, when we parked aside, I shot the image meanwhile dad went to buy chicken popcorn for me. You could also see a dog behind, and I found it friendly as it moves around undisturbed the employees coming out and in, which perhaps could be a kitchen. State govt. employees salary has increased to a height of ever; perhaps the double amount of their salary. But what bothers me here was doubt. When the employees were protested to bring back the old pension scheme, the govt. was very quiet or showed ignore attitude and even high court condemn and request employees to go back to work. Now the salary has ample increased! Why should we not doubt that this is a way to shut their mouth, so that they won’t speak out the corruptions or unheeded about it? I wonder when they could increase the salaries to all high, what the rulers would take home? I doubt will it grant to great heist ever in Tamil Nadu. At other hand liquor rates has increased in the state run wine shops (TASMAC), will sure fall on the labours head. I think the mighty rate of customers is labours and daily wage, who drink letting his family suffer and this price rise is sure to cut pocket of the family. No I am not supporting drunkards or encouraging. When the common interest is to close all the liquor shops, the govt. increasing the price and planning to open the shutdown shops only welcomes the drinkers and social illness. The price rise is obviously to compensate the elevated space of govt. staffs salary. So the govt. is only balancing the state without improvising either side (positively) or built a parallel income to liquor. Looks prohibition is like only a dream project that will never takes place, unless govt. takes conscious decision and rehabilitates drunkards. While riding on the national highways in July, on way to Thandikudi (Kodai) for vacation, we sadly hit number of butterflies which came knocking on the windshield and side windows around the belt of Tindivanam and Villupuram. It wasn’t an unusual thing while riding but this time we hit butterflies in plenty and the butterflies were emerging in and out of the median where flowering plants were at bloom. At many places across the highways flowering plants and shrubs are grown on the median to prevent flashing light from the passing vehicles in opposite at night and also to enhance the appearance of road. I have taken the NH 45 many times and ever hit the number of butterflies alike and we felt pity for these tiny lives. The butterflies that mostly knocked down were yellow and light green ones apart some red brown and orange butterflies. My cousin was driving the car and the knocked down butterflies leave back their trace on the windshield, turning it colourful and we counted about 5 different colours. The plants that adore the medians were mostly oleander and some kind of yellow flowers that produce nectar. So the butterflies were busy feeding on the sweet essence and being a highway it’s not possible to drive slowly, so could only feel sorry for these beauty species. 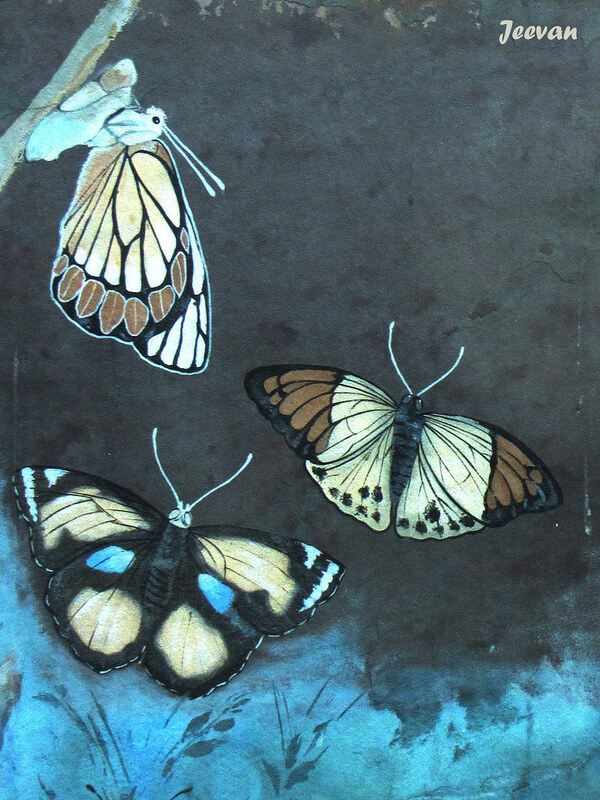 The rock painting of butterflies (pic above) was captured while waiting at the ECR toll gate to collect tickets. ECR toll gate is beautiful as same and I always try to capture some thing and the rock paintings are one. Lot has changed with my perception on things, as I keep learning and experience life people do not notice it easily or I haven’t exhibited or chance to do. Being mostly home bound, except my parents no one observes things at close or interested to look into but with each passing phase the transformation happens as I ponder over things. One such thing was stop believing there's God! This wasn’t a decision of all of sudden but layer by layer the thoughts inbuilt within and it isn’t a reflection of my frustration of being disabled or anxiety. It’s a conscious decision truly based on rational thoughts and inner feeling. Perhaps it could be my inability to obtain the feel of god but I wasn’t blindfold to stamp against others feelings and at same time I’m reasonable to feel unlike. I don’t hide or deny that I believed God once when I wasn’t truly conscious about things or understood life. 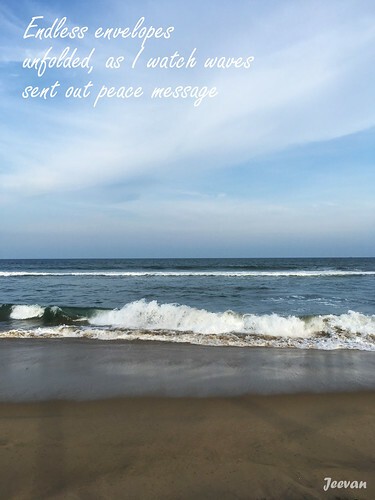 Though I don’t say I quite aware everything, but from my understanding which perhaps wrong, I couldn’t feel the god or hold faith. I might be wrong if I seek evidence and definitely there’s a power behind the rotation of earth and universe setting, but I couldn’t come to a term there’s god behind this exist. The transformation began within me more than a decade ago and many silent moments and questions answered me the same. Though my perception has changed I continue to capture or record things related to devotion or idol worshipping, and it doesn’t matter upon what belief it hold, I can’t deny the reality happening around me. But still many things haven’t changed or turned down and I like going to big temples not for worship but to admire the craftsmanship and take photos on the architecture and sculptors. I see big temples or churches as a landmark of history and marvel at same and some are beautiful (even they’re small shrines or mosque) to watch. I still get to smear sacred ashes on the forehead by the dear ones which I have no mind to stop or argue in disbelief, and that doesn’t mean I praise the lord but respect their feeling and prevent hurting. I never like hurting anybody and couldn’t do so and not only because it hurt me more than I do, I dare to confront not in fear but love. While I stay away from others religious belief, I can’t stand up the superstitions and will protest when needed. I grow up from a family that has been pious and my dad never misses a day to worship from the house altar (puja room) and going to temple on weekends. Mom does not miss her Friday worship and any monthly special days of worship apart celebrating festivals, people could wonder how come I differ in thoughts and against their devotional lifestyle. I believe faith can’t be forced on anyone and if it could be only distrustful will remain. Religion or faith should always be individual’s choice to accept or not. As a child one doesn’t have an idea or choice rather following their parents belief until they reach a stage of understanding and realize themselves what they want to be. Obviously I have all the rights already to choose what I want to be, but the only thing was I haven’t exhibited the transformation held within and I don’t think it’s needed anyone to know.